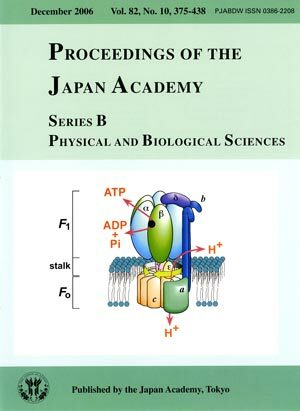 The entire features of two types of proton pumping ATPases, F-type proton-translocating ATPases (F-ATPases) and vacuolar-type ATPase (V-ATPase) have been clarified by Dr. Masamitsu Futai and his colleagues by their biochemical, molecular biological and cell biological studies over three decades. 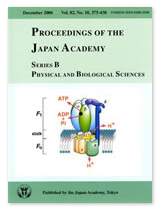 The cover illustration indicates their results on one of the two types of ATPases, F-ATPase. The structure consists of cytoplasmic F1 and trans-membrane Fo sectors which are connected by a stalk subunit. The catalytic domain of hexamer (α3β3) and the membrane domain (c) are shown. Yellow arrow schematically indicates the rotation of a subunit (γ) energetically coupling with ATP synthesis / hydrolysis and proton transport. The diversity of proton pumps of organelles and their stochastic fluctuation are the important concepts derived from the great efforts of Dr. Futai's group. Caption was prepared by Takao Sekiya, Member of the Japan Academy.